Dodoma — CLIMATE-change induced floods causes an estimate of Us$2billion in damage yet killing hundreds every year and without a massive investment in solid waste management it is expected to get even worse. A report published by Nature Climate Change last August claims that flood damages for the globe's 136 coastal cities which include Tanzania could cost Us$1trillion annually by 2050 if protective measures aren't put in place. Tanzanian experts are trying to analyze the impact of climate-based disasters' huge cost on budget of Tanzania's government. But it remained relatively unclear on the final sum of shillings poured each year as remedies. A Civil Society Organisation dedicated to sustainability, equity and accountability in water resource management --Shahidi wa Maji (Water Witness) has released its report, "How well are we responding to Tanzania's growing flood hazards?" indicating the East African nation lose an estimated 4.5trn/- annually. In simple terms, the amount is two times the state budget for the Ministry of Health, Education, Home Affairs and Environment combined for the financial year 2017/18. It also means at least 12.512bn/- is lost every day thanks to the impact of floods. A clear picture is, the new students hostels at the University of Dar es Salaam (UDSM) constructed to accommodate 384 students were built at the cost of 10bn/-. However expert says so with protective measures, such as dikes and levees, total flood damage will cost between Us$60 billion to Us$63 billion by 2050. In its report, that explores the effectiveness of Tanzania's framework for protecting citizens against flood impacts by examining the case of Gulwe in Mpwapwa District in Dodoma Region. A joint initiative between Shahidi wa Maji, TaWaSaNeT and Water Witness International --Uhakika wa Maji programme says "Like many parts of the country, Gulwe village regularly suffers from severe flooding after heavy rainfall.
" Five Tanzania regions --Morogoro, Dar es Salaam, Dodoma, Mbeya and Tanga, ranked among the top areas with highest projected flood losses in 2017. Well documented impacts include destruction of livelihoods, property and infrastructure of strategic importance to the national economy, imposition of food insecurity and water borne disease, homelessness and loss of human lives.
." Tanzania government is spending millions of dollars investing in infrastructures with the latest being the Standard Gauge Railway (SGR) line which is projected to play a transformative role in the country's economy. The infrastructure cut across Dodoma and Morogoro where floods are prone. Works, Transport and Communication Minister Prof Makame Mbarawa revealed last week, the state-owned Reli Assets Holding Corporation (Rahco) lost nearly 5bn/- in the last month's downpour which swept part of the line. Prof Amos Majule, Climate Change expert from the University of Dar es Salaam says the government had also invested billion of shillings in several years of adopting climate change mitigations by developing laws, policies and strategy to reduce disaster risks. But "I can confirm that we're having a problem despite government measures." The new study by Uhakika wa Maji programme suggests that flooding problems are on the rise because of changes in land-use and shifts in weather patterns caused by climate change. It says catastrophic levels of soil erosion in the headwaters of rivers and poor solid waste management means that river channels are choked with sediment and rubbish, and flood much more quickly. "At least 51 percent of Tanzania's soil is being degraded because of deforestation, overgrazing and unsustainable farming methods, and soil erosion, costing the country each year," the report said. adding; "Poor land use, planning and enforcement means construction within floodplains, exposes communities to extreme flood risk." Worrying details from the Office of the Prime Minister shows there only 15 District Emergency Preparedness and Response Plan since 2012. Tanzania is home to 182 councils, however the Disaster Management Act 2015 calls for establishment of such plans.
." A similar statement was also issued by the Head of State, President John Magufuli. It was further stressed by his Vice Ms Samia Suluhu Hassan and Environment Minister Mr January Makamba when they visited the affected families. The National Operating Guidelines for Disaster Management of 2014 had identified the Ministry of Water and Irrigation as responsible state agency to manage flooding, but critic worry that no special budget had been allocated for the purpose. Observers also argue that the strategic commitment did not appoint a particular officer who will be responsible to link management of catchments, land-use and water resources to effective flood protection. "Coordination between authorities and agencies which could reduce risks and address causes of flooding appears to be weak," says Ms Askinia Lyambal, Board Member of Tanzania Water and Sanitation Network. She says it is critical for the nation to prepare before natural disasters occur in order to increase safety, protect property, and decrease costs. Marita Mabula, 60, died along with her two grandchildren when floods killed four people in Ising'u village in Mpwapwa District last year. The family says no support has been extended so far and wants to advise the government to ensure the regional and district disaster management committees effectively operate with sufficient human and financial resources. Jenista Mhagama, Minister of State in the Prime Minister's office responsible for policy coordination says the government had adopted a law to help authorities cope with emergencies and shield vulnerable communities from disaster risks. "The law establishes a Disaster Management Agency. This is responsible to oversee efforts that include to prevent damage and deal with the impacts of floods, droughts, hail, storms and hunger," she noted. The Minister was optimistic that the agency will bridge gaps in the country's ability to deal with both natural and human-made disasters. 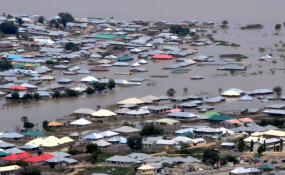 According to official government reports, a major factor contributing to flooding is the very high sediment load caused by soil erosion because of expansion of unsustainable cultivation, deforestation and overgrazing in upstream tributaries.